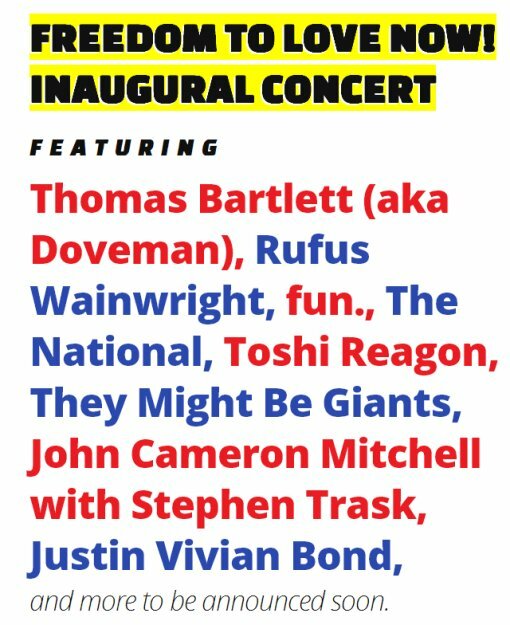 Freedom To Love Now: A Concert For Marriage Equality w/ The National, fun., Rufus Wainwright and More, Tickets on Presale Today! Proceeds will benefit Freedom To Marry. A limited amount of presale tickets are available TODAY, Friday, September 7 from 4PM to 11:59PM before they go on sale to the general public Saturday, September 8 at 10AM. FreedomToMarry.org roadmap video after the jump.